This attractive pocket-sized devotional features 365 undated daily Bible readings with commentary, prayers and further study questions, as well as a topical index for easy reference. The material is drawn from six popular past issues of Every Day With Jesus: 'His Story - Our Story', 'Poet of Hope', 'Authentic Apprenticeship', 'Complete in Christ', 'One Foundation' and 'Being Transformed'. An inspiring handbook for those who are new to the Christian faith, and for those who want a refresher course in the basics of spiritual growth, presented clearly and dynamically. For every day there is an encouraging, insightful reflection by Selwyn Hughes, along with prayers and Scripture passages for further study. Dozens of relevant topics are covered, including: the call to discipleship; growing in faith and love; praying, praising and listening to God; perseverance, serving, forgivness, and much more. This attractive pocket-sized devotional features 365 undated daily Bible readings with commentary, prayers and further study questions, as well as a topical index for easy reference. 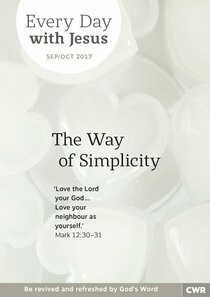 The material is drawn from six popular past issues of Every Day With Jesus: 'The Uniqueness of our Faith', 'The Search for Meaning', 'The Twenty-Third Psalm', 'The Spirit-Filled Life', 'Strong at the Broken Places', and 'Going Deeper with God'.